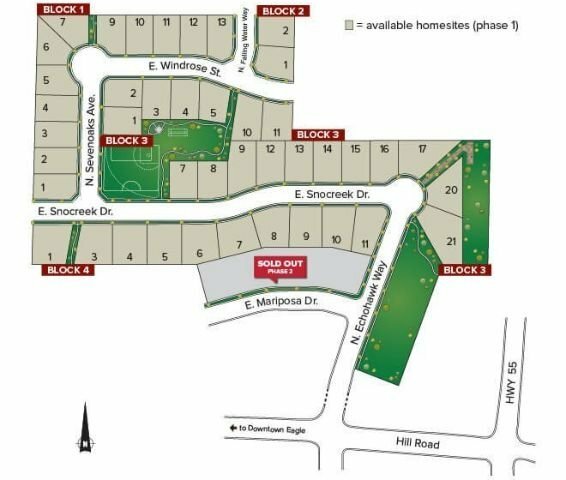 The Wycliffe Estates subdivision is a new home community located in Eagle, Idaho. The community is minutes from downtown Eagle, ID. Nearby access to Highway 55 offers convenience to shopping, restaurants and weekend getaways. A short bike ride from Wycliffe Estates takes you to the Boise Greenbelt or Guerber Park. Wide open spaces and a clear view of the Boise foothills included. New home prices start at $284,990. Search all new homes in Eagle at WeKnowBoise.com, your source for local home builders and new subdivisions in Eagle, Boise and throughout the Treasure Valley. From State Street/HWY 44, go north on HWY 55. Turn west (left) on Hill Road. Turn north (right) on Echohawk Way to the Wycliffe Estates subdivision.